A new marketing category: the strainer. After thirty-six years, the BCG matrix is finally ready for revision. The question mark, star, cash cow and dog have made a new friend: the strainer. ‘The colander’ appears misleadingly to the marketing strategist as one of the usual suspects, so he thinks he should act according to the old manual of the Boston Consulting Group. But thanks to raging technology, this BCG growth model needs to be supplemented. The old BCG matrix cannot be continued. This thing has facilitated the life of product strategists around the world for thirty-six years: your product is either a question mark or a star or a cash cow or a dog and nothing else. But now the expiry date in any way is exceeded. In 2013, technological development is going so fast that this widespread thinking-in-four-old booths leads to wrong decisions. Why was the Boston Consulting Group Matrix again so useful? It classifies your product portfolio into segments of potential market growth and market share. In fact, you plot the BCG into earning potential (L / H) and competition force (L / H) against each other. Subsequently, it tells you what to do. To the star, with its high market share in a high growth market, you add new functionalities. You utilize the cash cow because it has a solid share in a mature market. You take the dog (low growth, low share) to the shelter and with a question mark (low share but high growth potential) you do what God has forbidden. What is the BCG-matrix again? In the early seventies, the Boston Consulting Group developed a matrix in which products or business units are assessed by two characteristics: the relative market share that the product has acquired in relation to the largest player in the market and the growth potential of the market for that product. A question mark, also called problem child or wild cat, has a small market share in a growing market. It is still uncertain whether this is going to be a star or a dog. A star has a high market share in a growing market. With targeted investments we should retain the lead until the market is mature and the question market becomes a cash cow. 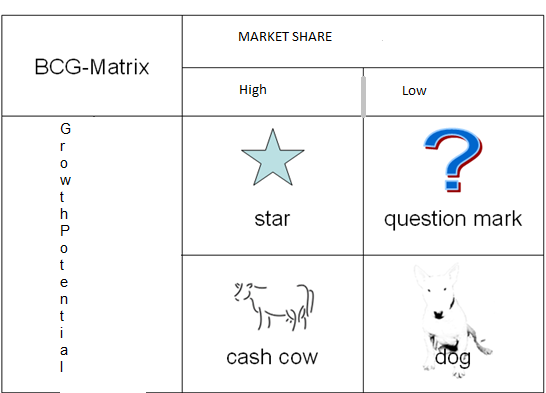 A cash cow has a high market share in a stable, mature market. These revenues should be used to invest in other products. A dog has a small market share in a mature market. If it does not yield a strategic interest, you are better off avoiding it. What do you do with the BCG-matrix? The ideal development path for a product leads from question mark via star to cash cow. Some products never get beyond the question mark and become a dog. For the company in question, this is a costly affair. Ideally, on the long term it provides money that is invested in a new question mark. The implicit idea of BCG’s matrix until now was: as long as you’re running sales, you are doing fine. If you are not, you’re a dog. But a product is only dead when you do not make any profit on it anymore, the simple market trader might think. If you do not make any more profit? Worse, the two flagships star and cash cow suggest that you still make a profit thanks to their high market shares. That gain, however, can be evaporated after a long time. Thus it may be that your worn production unit must be replaced at high costs. Or there are government regulations and taxes that make your variable costs higher. Or, and you see that more often, you should lower your prices as competitors with newer technology can provide the same functionality much cheaper or better. Worse, that better technology lies within your own company and is self-developed or purchased. In addition, you think that you, with your old technology, still have a great star, or at least a cash cow, in hands but in the meantime the profit seeps away like a sieve. Finally, sometimes a product is just ‘out’. No explainable reason. Hypes are simply hypes, and disappear in much the same way. There are old familiar examples. Steam locomotive versus traction. Horse tram versus car. Telex versus telephones. Records versus CDs. Fax versus mail. Letter mail versus e-mail. CD-i versus CD-ROM. V2000 versus Betamax. But the past years new examples are tumbling over each other. VoIP versus traditional telephone. Incandescent versus CFL or LED. GSM versus UMTS versus WIMAX? Nintendo DS versus Nintendo Wii. The first technology is still quite functional, but unfortunately is no longer state of the art. The economic life turns out to be shorter than the technology – a situation which BCG is not taking into account. Once the commercial and technological life diverges, the original BCF-matrix no longer applies. The old photography companies thought they had something valuable in their portfolio. But that turned out to be a strainer, gone within seconds. The cash cow they longed for turned out to be a strainer, a product that generates cash now but is losing margin at a very high speed. The speed of technological substitution is only increasing. Take a look at the audiovisual industry. In the eighties, video reached a penetration rate of 70% very slow, which Youtube outclassed in a year. Or take photography. After its invention, it took seventy years before ordinary people could buy an analog device. Around the world, Agfa and Kodak built large effective development centers for their cash cow – the analogue clockwork – at the time when the digital revolution was gripping around at a punishing pace. The old photography companies thought they had a bowl with valuable content in their hands, but it turned out to be a strainer which was empty within a few seconds. Their cherished cash cow proved to be a miserable strainer. A product, which currently has a bigger turnover due to a large market share, with margins disappearing in every way. Another strainer? Perhaps the coal plant centrals which are being built now and are expected to last for 40 years. If you look at the rate at which energy is already decentralized, think of your own solar or hydrogen power central in the garage later – my prediction is that centrals rapidly turn out to be a thick strainer, will be overtaken by technology. Look what is happening to the free record shop now. Analyze your portfolio! What about old-fashioned telephone, plain old telephone service (POTS). That market is still exists, but in the meantime, volume and rates are decreasing. You can no longer call it a dairy cow, because investing in further cost reduction of this form of speech transmission does not yield anything anymore. Nor is it a sick dog that, according to BCG, can just be euthanized because you’re making profit on it now. If you’re honest with yourself, you know one thing for sure. In a few years pots no longer exist. Everybody will call with VoIP or anything else that transports voice and data efficiently. And texting will be replaced by whatsapp or similar. Is the paper a strainer? What do you think? We shall soon find out. What now? Think outside of the box, the modern theory of the strainer says. Are you not making any profit on your question mark for now, but you expect it will in the future? Then do not just invest heavily in attractiveness. Look around carefully first. It could be a strainer, where something else whips out from an unexpected corner. It (almost) happened to Nokia. Like Kodak, will you invest in more efficiency and smarter operations in analogue photo development because you think people will gradually want to pay less for this cash cow? Do you build an additional terminal like Schiphol for faster handling of the ever popular flights to Paris? No, it could prove to be a strainer once the high-speed train from Amsterdam really arrives. That time is coming, and sooner than you want to know. Did you ever, as ABN Amro, buy the worldwide network of offices back ‘for a pittance’ from the Scots? A waste of money because the future now belongs to subdued, sustainable internet banks. The “own mortality” does not seem to sink in. Do you, as an organization, invest in massive scaling and are you importing well paid management layers and are you investing in rigid ERP systems because you believe this is the only way to, for example, make care affordable? No, your time has come. Your employees walk away from their undervalued jobs and register as a freelancer in small-scale businesses that work forty percent cheaper and provide more satisfied customers. And as the producer of the telex – a dog that is overtaken left and right by phone, fax and email – do you think that you have to fulfill a particular utility because some official documents can only be recognized if they are sent by telex? A day will come when the price has dropped below its belt buckle, and that it no longer working out. A small software company has developed a special digital service for this type of transport. With this, the telex can finally be handed over to the museum. The BCG recipe deserves a heavy revision. What now? First, an organizational intervention is needed. In many technologically driven companies – Nintendo, Philips, Kodak – you will still find it quite common that strainers remain competitive with newer products in the same range. They do not know that they are strainers. In compartmentalized business units, people with autonomic targets work diligently on their question marks, stars and cash cows. They all think that they are very important. Immortal. One delivers cash, the others a future. But one technology is not “it” anymore, the other is not totally “it”. Has a visionary in the board a plan ready for a smooth substitution from one to the other technology? Does she dare to write off a small question mark because it is a strainer? Does he dare treat a star like a cash cow by sowing no more and continuing to draw the harvest? Maybe it’s better to place a high fence around the strainer and then seal it off under a B brand. Or rather: flogging it immediately. Would anyone want the old stuff? Then they will have to learn how to manage several lifecycles simultaneously. To that end, the new and the old world are joined under one boss. He will force people in that operation to work together. One P&O, one marketing organization and one interest. The most important lesson of the strainer? The discovery of it in your company is the acceptance of your own mortality. Unlike the old BCG matrix which still underlies that capitalist growth ideology that came to an end in the depression of 2009 until today, accept the strainer. Consider the world and yourself principally as a mortal. « The marketing agenda in the internet time. Part 5: Marketing organization: who’s at the wheel in your organization? I am agree with the write .To innovation of new technology and internet chance the concept of marketing .Most of the business are going to online and people accepted it very easily. thanks.